Videos : Flyers look back: The Legion of Doom dominates. 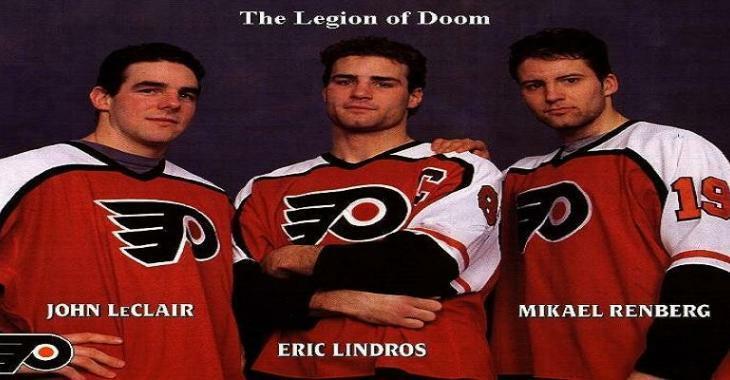 Flyers look back: The Legion of Doom dominates. It's a quiet news day in Flyers land so it feels like a good time to take a look back at one of the most dominant eras in Flyer's hockey history, The Legion of Doom. Formed in the lockout shortened season of 1994-1995 by Terry Murray and Bobby Clarke, who were in their first season with the Flyers, The Legion of Doom was one of the most feared lines in hockey. Eric Lindros, John Leclair and Mikael Renberg struck fear in the hearts of opposing defensemen and goaltenders alike across the league. Not only where they a dominant physical presence on the ice, but they had incredible creativity and scoring talent for men of their size. Something they clearly demonstrated when they almost single-handedly destroyed the Montreal Canadians 9-5. Enjoy this look back video at the legion in their prime! As you can imagine, this video will not be in HD!